Lapghan Blanket – Snuggle up with this large solid shell stitch lapghan blanket. You can mix up different colors to make a bright and cheerful one or use warm Autumn colors. There is nothing better on a cold evening than to put your feet up and relax with a warm blanket around you, I have crocheted it in a close stitch for extra warmth and on a large hook so it grows faster. Row 4 – ch1, 1sc in base of ch1, * skip 2dc, 5dc in next sc, skip 2dc, 1sc in next dc, * rpt from * to * to end. Turn. Row 5 – Rpt Row 3. Three times in color 3. # Once in color 1. Three times in color 2. Rpt from # to # 3 more times. Rpt Rows 4 & 5 once in color 1. You should have 90, 5dc group rows plus 1sc row worked in all or work measures approx 39 inches from beginning. Row 92 – ch1, 1sc in base of ch1, * ch2, skip 2dc, 1sc in next sc, ch2, skip 2dc, 1sc in next dc, * rpt from * to * to last sc, 2dc and ch3 to turn with, ch2, skip 2dc, 1sc in sc, ch2, skip 2dc, 1sc in top of ch3. Turn. Row 93 – ch1, 1sc in base of ch1, 2sc in each ch2 space and 1sc in each sc to end. Fasten off. Work 1 row of crab stitch (see abbrev) around all the four sides of blanket. Finishing – Weave in all loose ends of yarn and trim off. 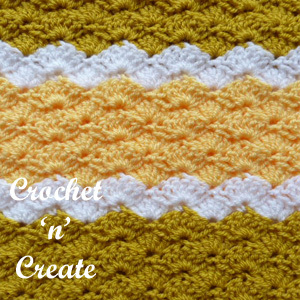 Hope you enjoy this free crochet pattern for a lapghan blanket. The written instructions and pictures for this lapghan blanket pattern are copyrighted to crochet ‘n’ create © 2017. You are welcome to sell the finished products made from the free crochet lapghan blanket pattern, I just ask that you use your own pictures and put a link back to crochet ‘n’ create. 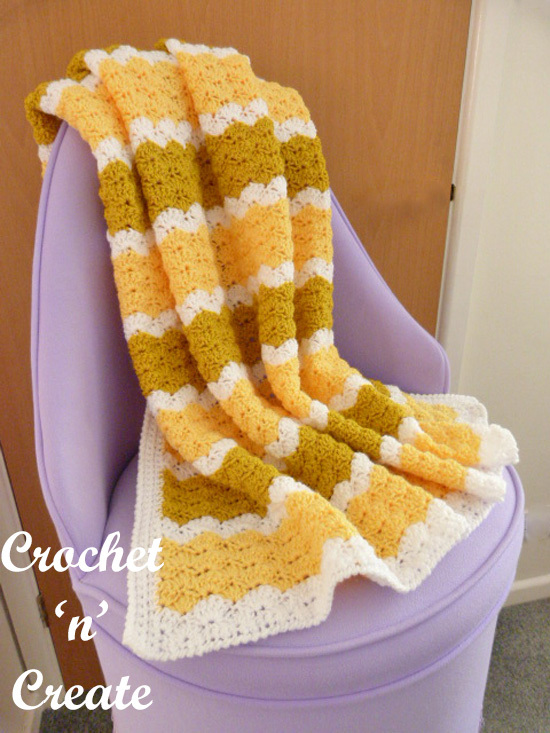 If you wish to share this crochet lapghan blanket pattern on social media or your blog please only use a direct link to the pattern page on crochet ‘n’ create. 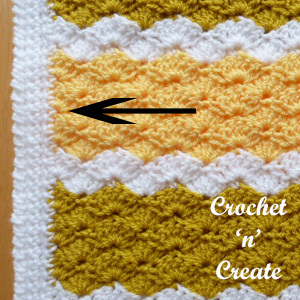 This entry was posted in crochet blanket, free crochet patterns and tagged crochet, crochet blanket, crochet for home, free crochet patterns on 17th August 2017 by crochetncreate.